When the National Council of Churches in India (NCCI) Assembly was held in Shillong in May, 2008, Mr. Lyngdoh was Dy. CM of Meghalaya and attended the inaugural session to represent the State Government. Mr. H. S. Lyngdoh was elected Elder of Mawkyllei Presbyterian Church (PCI) in 1977 and continued serving as Church Elder till his last breath. He also served as Vice Chairman of the erstwhile KJP Synod's Youth Fellowship, member of Synod's Executive Committee and other Committees. He regularly attended PCI General Assembly's biennial sessions and was a popular preacher. 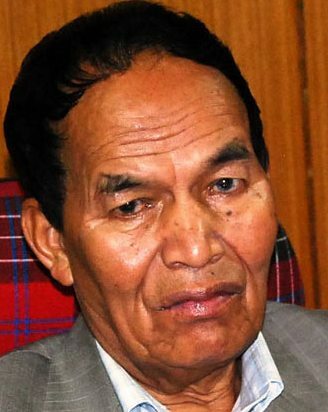 His body remains will be taken to Nongstoin, the District and Constituency headquarter on September 28, 2015 morning for Government's last honour and people of West Khasi Hills to pay their last respects then taken to Mawkyllei, his village for the funeral. His funeral will be held on Tuesday, September 29, 2015 at Mawkyllei Village, West Khasi Hills, to be conducted by Pariong Presbytery. Mr. Hopingstone Lyngdoh was a bachelor and lived with his closest maternal relatives all his life. He was a man for others and he once said: "When my people are still riding in a pony cart, I can't travel in an Ambassador car... When the people are climbing the stairs, I can't go up in a lift."